Complete Service Request SR-ta-001: Scheduling System Database. Note. This course utilizes the Virtual Organizations, an Apollo Group, Inc. learning tool. The Virtual Organizations portal is accessed from the link on your course materials page. Submit the memo and Microsoft® Access® database file to your facilitator. Individual Paper and Database Complete Service Request SR-ta-001: Scheduling System Database. Note. This course utilizes the Virtual Organizations, an Apollo Group, Inc. learning tool. The Virtual Organizations portal is accessed from the link on your course materials page. 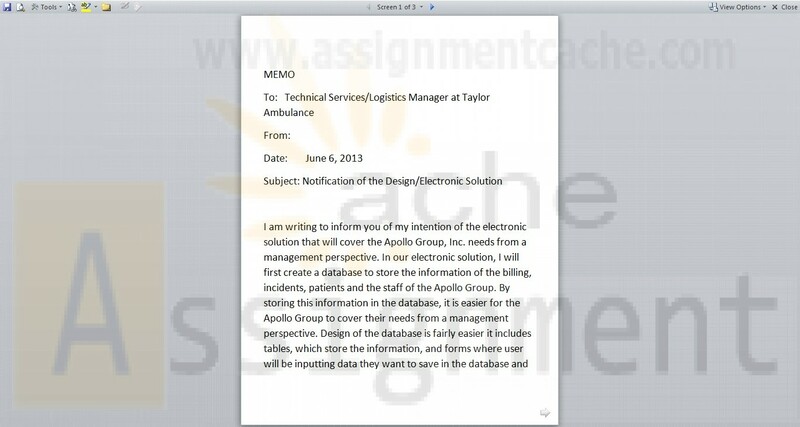 Write a 300- to 350-word memo to the Technical Services/Logistics Manager at Taylor Ambulance explaining the following(5 pts) · The design you will use · How your electronic solution will cover their needs from a management perspective Create a Microsoft® Access® database using the Entities and Attributes document provided with the Service Request. Include the following(8 pts): · Tables with appropriate data types and keys · Descriptions · Format · Masking Submit the memo and Microsoft® Access® database file to your facilitator.